The File Manager is used to manage all your files for your website and is where you store the files (such as documents, images, audio, videos, etc.) you're going to be using on your site. On the top menu bar, click Files. The File Manager dialog box will appear. 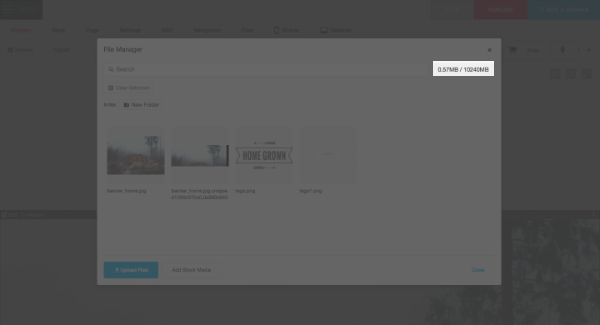 You can now upload images or files, create new folders, delete unused files or images, edit an image using Aviary (an online photo editor) and much more. On the main menu, click Files. Click Upload Files, on the bottom left corner of the File Manager. 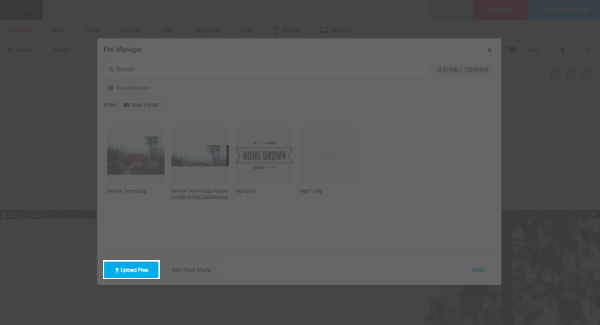 Browse your computer's folders for the file you would like to upload and click OK to upload it. Once you have uploaded the files, click on the "X" on the top right of the File Manager screen to close it. Now your images are stored in the File Manager. *Note: Please ensure that your file names do not contain any special characters such as accents, symbols, etc. The file names need to consist of only letters and/or numbers. Zip up your files on your computer. Upload the zipped file to the File Manager. Once the file is uploaded to the File Manager, right-click on the file and choose Unzip. When browsing your computer for files to upload, hold down the "shift" or "ctrl" keys to select more than one file to upload. Click the mouse to select the files. The selected files will be highlighted or outlined. Click Open to add them to the File Manager. Click the New Folder icon in the File Manager. Enter the name of your folder and click Add New folder. To add files to the folder, simply double-click on the folder. The folder will open and you can upload your files there. You can create folders within a folder by following the same steps. Click a picture you would like to move. Right-click on the file and select Copy from the drop-down menu that opens. Go to the folder where you would like to move the file. Right-click in the empty space and select paste. Your file will now be pasted in the new folder. 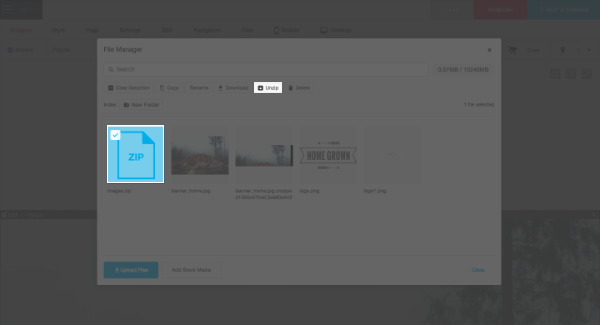 You can now go back and delete the older file by right-clicking on it and selecting Delete. 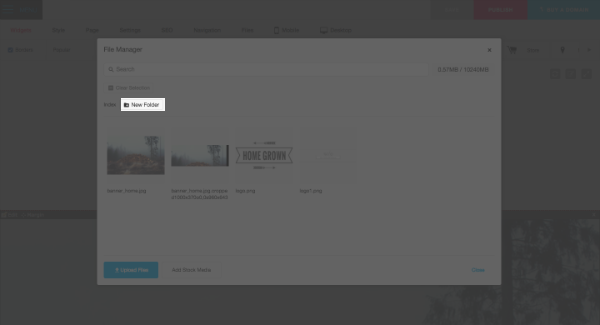 Click Edit on the top-left of the File widget. Navigate to the file in your File Manager. Click Select. This will ensure that the correct path is used for your file. Locate the file you wish to delete. Enter the name of the file you wish to search for in the "Search My Files" field. You can search all files or choose a particular folder to search in. The File Manager will open up. . Select the uploaded file you want to add and click Select. The image will be added to your page. 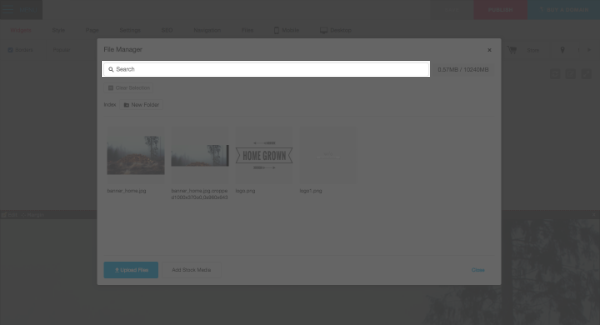 You can also click Upload Files to upload a file from your desktop or click Add Stock Images and search for an image Pixabay's library (a feature available on certain paid packages). Click Insert Image icon on the Text Editing Toolbar (the icon that looks like a mountain scene in a picture frame). The File Manager dialog box will pop up. You will have the option to Upload New Image or Browse Uploaded Images. Using the Text widget allows you to insert a number of pictures in the same text box. You can add as many pictures in a row as your chosen style will support. Separate each picture by one or two spaces for the best result. Go to Widgets and select Media from the drop-down menu. 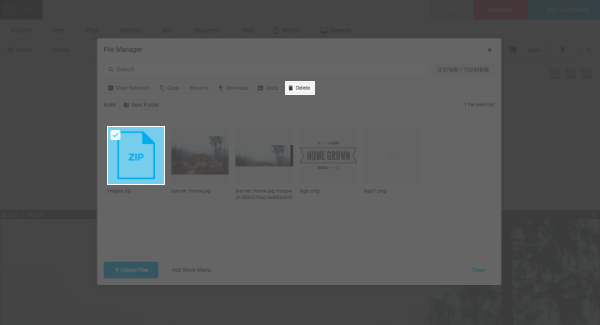 Drag and drop a File widget onto your page. 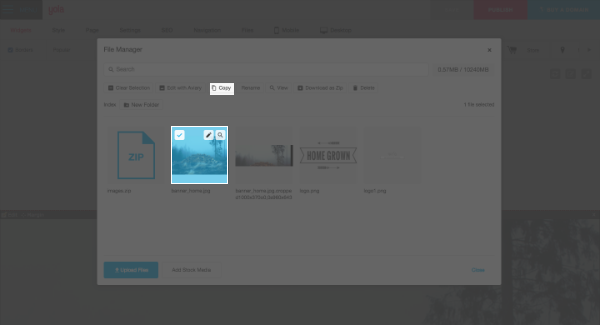 The File Manager will open up, allowing you to select an existing file or Upload Files to add new ones. Once you've selected your file, click Select. People will then be able to click on your link and download your MS Word file, PDF, PowerPoint presentation, spreadsheet, or whatever file you have uploaded. The File Manager has an indicator which shows you how much of your allotted storage space you are using. Depending on the package you have selected, the storage limit will vary.